Richmond has a robust and engaged marketing community with a long history of producing world-class work. There is seemingly an organization for every discipline, and one could easily fill his or her calendar with happy hours, meetups, and networking events just within the marketing realm. I try to attend and support as many groups as I can, but I quickly realized that none of them focus solely on digital marketing and analytics. I started meeting with a few colleagues once a month for lunch to talk about analytics, data, and digital marketing. Our conversations were always enlightening and left me wanting more interaction, more stories, and more ideas. We wanted a larger lunch table packed with other smart people. The Richmond Digital Marketing Meetups grew out of these lunches, and our first two events were more popular and more inclusive than we ever could have imagined. It was clear we tapped into an unmet demand. Along the way, the other organizers and I learned a few lessons that might help other meetup groups get up and running. Build offline relationships in a digital community. Kyle, Demian, Susan, and I simply wanted to extend the size of our original lunch table. We assumed other digital marketers wanted to share the same conversations and that a simple meetup could be the catalyst to bring like-minded people together. Share what we have learned and learn from others. Each of us had different specialties and experiences. None of us were experts at everything. The more voices and opinions, the better! Find an underlying cause for your group and share it to attract others with similar goals. Make it about the content, not the organizers. Valuable content and relationships will keep people coming back. We have found that the highest-rated presentations have a healthy balance between sharing advanced knowledge and practical “how to” advice. Remember that attendees are there to learn, not to be sold. Avoid the temptation to promote your product or service too aggressively and don’t let other speakers, sponsors, or attendees commandeer your events for their own direct benefit. There will be plenty of opportunities for follow-up conversations later. Start small. Don’t overcomplicate things. Should we provide food? If so, what kind of food? What about gluten-free options? Should we have beer and wine? If so, what kind of licenses do we need to get to keep it legit and minimize liability? What if people don’t show up? Do we need to have printed sign up sheets and directional signage? What are the immediate action items after every event? What happens if too many people show up? We quickly realized that there was no way to know what to expect, and that simply providing a venue and content would be enough. By keeping the initial expectations low, we did not run the risk of overpromising and under delivering. Gather a lot of feedback. 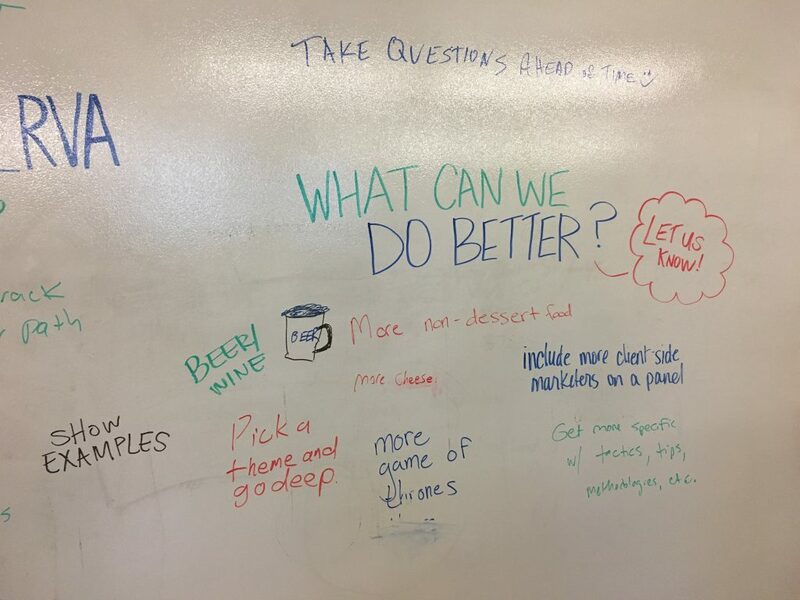 We were able to gather a lot of feedback to learn what was working and find areas to improve. We don’t claim to have all the answers, and we encourage our members to suggest topics, ask questions, and volunteer to help as the need arises. We also gather comments and ratings on the Meetup.com page. If all that were not enough, we share an online survey at every opportunity. Recruit volunteers. Don’t try to do it all alone. If you can clearly state your objectives and that you are in the early stages of building a community, you should be able to find people that want to join the cause. Volunteers can help organize venues and speakers or assist with logistics at the event. Make sure to tap into your existing community to get the right people on board! The best sign of engagement is people sharing their reviews, photos, and summaries online after the event. For example, Laura O’Brien shared the panoramic photo above and Doug Lucy wrote a great recap post on LinkedIn that helped build an audience for our group and for his excellent writing. Plan for what happens before, during, and after the event. Here is a simple checklist that we developed to make sure that our events run smoothly as possible. This is a work in progress, and we are constantly improving our approach based on feedback and observations at each event. Give everyone an opportunity to share. 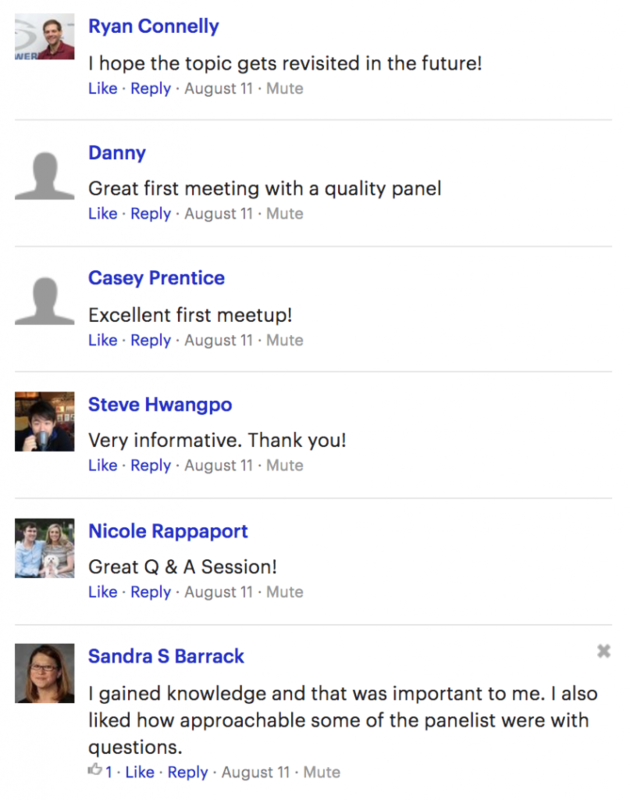 Meetup groups thrive when multiple members share their experiences. Create a comfortable place where anyone can contribute. The collective knowledge is far greater than any individual’s. Some people are uncomfortable in front of a group, and that is ok. We have received suggestions to create smaller breakout groups and build in plenty of time for networking before and after our events to allow everyone the chance to share something. Our meetup format will continue to evolve so that we can all continue to learn from each other’s experiences. Looking for a group of fellow data nerds to hang out with once a month? Join the meetup group and let us know what we can do to make it better!